The Bell 407GXi has a Garmin G1000H NXi integrated flight deck that is ADS-B compatible. 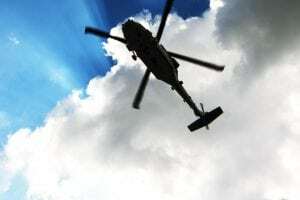 Helicopter operators are ramping up installation of Automatic Dependence Surveillance-Broadcast (ADS-B) Out technologies to meet the FAA-mandated Jan. 1, 2020 deadline, but operators face a significant lag. In 2010, the FAA finalized regulations 14 CFR § 91.225 and 14 CFR § 91.227, requiring aircraft operating in most controlled airspace to have an ADS-B Out system to broadcast the aircraft's position and other information. 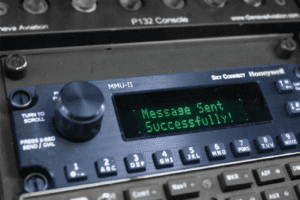 ADS-B In systems to receive the broadcasts and messages from the ground network, such as Traffic Information Service-Broadcast and Flight Information Service-Broadcast, are not required, but if an operator chooses to equip an aircraft with ADS-B In avionics, a compatible display is also necessary to see the information. While the rate of U.S. helicopters equipped with ADS-B Out was about 30 percent in January, it jumped to 36 percent at the end of last month, according to the FAA's ADS-B Equip team. The 3,520 rotorcraft currently equipped with ADS-B is up from 3,148 in December. "Progress is being made, but plenty of work remains," said Jenns Hennig, the vice president of operations at the General Aviation Manufacturers Association (GAMA). "We don’t want to see any rotor craft have reduced access to airspace in 10 months when the mandate goes into effect." "Some of the factors that make the [ADS-B Out helicopter equipage number] lower than the fixed wing fleets, especially compared to the airline or business jet fleet, which was at a 68 percent ADS-B equipage rate last month, may be driven by the structure of 14 CFR 91.225 in that only airspace above 10,000 feet and in Class B/C, etc., is captured," Hennig said. "I would expect a notable portion of the civil rotor craft fleet not operating in parts of the rule airspace, but also that many rotorcraft do operate in that airspace – at least on certain flights." Hennig said there are other factors behind the lag in ADS-B helicopter installations. "As an example, while we saw the initial airplane ADS-B approvals being issued by the FAA as early as 2011 — for a commercial air transport airplane — and then an increasing number of approvals issued by the FAA for the general aviation airplane fleet in 2012 and the following years, including Approved Model List Supplemental Type Certificates, the rotorcraft solutions were not widely certificated by the FAA until a couple of years later," he said. While a breakout of the latest figures was unavailable on March 26, of the 2,266 commercial rotorcraft accounted for by make and model in the 3,148 tally last December, Bell had the highest number of ADS-B equipped helicopters with 1,218, followed by Airbus Helicopters at 729, Leonardo at 191, and Sikorsky with 128. The Bell 407 was the model with the most ADS-B installations — 466, followed by the Airbus AS350B3 with 116, the Leonardo AW139 with 88, the Bell 429 with 83, the Leonardo AW119 MKII with 58, the Sikorsky S-76C with 43, the Bell 505 with 43, the Sikorsky S-92A with 38, and the Airbus AS350B2 with 32. "I’m not sure there would be any meaningful correlation to make/model beyond the mission sets that the aircraft fly and the intended airspace within which they will operate," Chris Martino, the vice president of operations for Helicopter Association International, wrote in an email. "For corporate and air medical aircraft, as examples, we’d expect the installation rate to reflect the fact that the aircraft would be operated in and around airspace that requires ADS-B equipped aircraft," he wrote. "The same logic would be true, for example, for flight training aircraft that operate in very limited airspace. The equipage rate we’d expect to reflect the fact that those aircraft won’t be operating in airspace that requires ADS-B equipped aircraft. Also, based on the numbers [above], there’s just under 900 not accounted for in the tally. I suspect the breakdown of those aircraft would reflect the above as well." Hennig said that "generally, however, we have seen other [general aviation] aircraft have high equipage rates if in production because manufacturers started including ADS-B enabled transponders as standard equipage a number of years ago." Military rotorcraft are also getting in the game to comply with next year's ADS-B deadline. For example, L3 Vertex under a U.S. Navy contract has been providing ADS-B to dozens of TH-57 Sea Rangers, a military version of the commercial Bell Jet Ranger 206. Though mainly used for training, the Rangers also are employed for photo, chase and utility missions. Like all rotorcraft, they require DO-260B ADS-B-compliant transponders and GPS receivers. In 2009, the FAA launched ADS-B in the Gulf of Mexico. In a joint effort with the FAA, Helicopter Association International, the Helicopter Safety Advisory Conference, helicopter operators and oil platform companies, the federal government installed ADS-B transmitters and weather observation and communications equipment on 12 offshore platforms, and operators equipped their helicopters with ADS-B avionics. While such offshore rotorcraft were early leaders in the installation of ADS-B, the rotorcraft sector as a whole has suffered from misconceptions about the mandate and, partly as a result, rotorcraft installations of ADS-B have lagged. The FAA's Equip 2020 working group, established in 2014 by then-deputy FAA administrator Mike Whitaker, provides quarterly updates on ADS-B equipped aircraft. "We did get some testimonials at the Equip 2020 working group in early 2018 that there was a perception within at least part of the rotorcraft community that ADS-B was only required for Instrument Flight Rule operations, which is obviously incorrect based on a reading of the rule," Hennig said. "The testimonials were a set of one-off comments encountered by stakeholders, but the issue raised a general concern about the need for additional education across the community to ensure that there was no misunderstanding of the upcoming mandate. As a result of this feedback, we placed a specific focus from industry and FAA in Equip 2020 on engaging the rotorcraft community to ensure that the requirements of the rule were fully understood." Like radar, ADS-B pinpoints the location of helicopters and aircraft and has increasingly allowed operators to fly in inclement weather. But the FAA is encouraging the move away from radar to ADS-B, which the FAA heralds as an environmentally friendly NextGen technology permitting precise tracking using satellite signals. 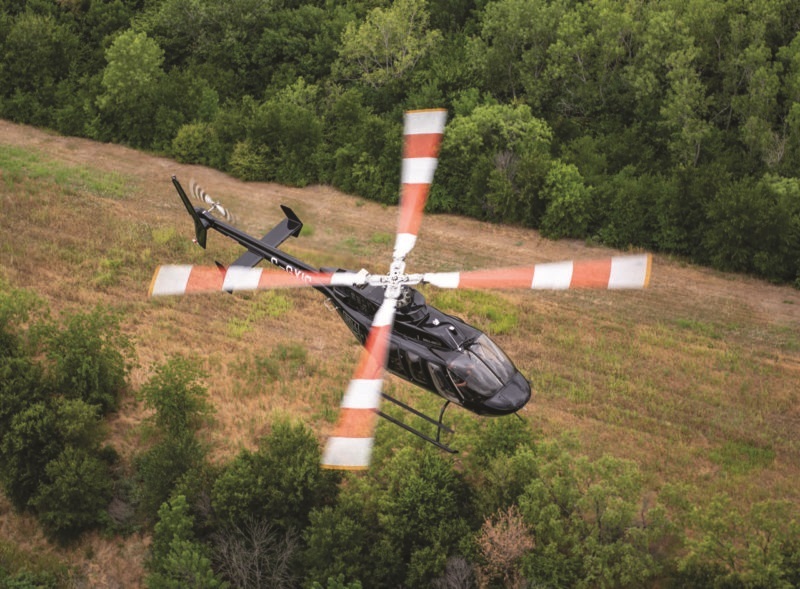 Hennig said that helicopter operators should undertake three steps to understand whether they need to install ADS-B technology on their rotorcraft. "Step one is for the operator to review and understand what airspace they fly in and whether it will be subject to the ADS-B mandate," he said. "The FAA has an interactive website that lets anyone determine the location of ADS-B airspace. Does the operator fly in the airspace regularly? If yes, take the steps now to equip, because facilities that do upgrades are already scheduled months out. If the operator does not fly in ADS-B airspace or, alternatively, only flies in ADS-B airspace occasionally, then the urgency is not the same and the operator may simply elect to circumnavigate the ADS-B airspace on those flights — at least in the short term." "Step two is for the operator to understand the state of their aircraft and the path to ADS-B compliance for their specific aircraft; its current equipage, i.e., what transponder and GPS; and what they would like to do as part of the upgrade," he said. "Some transponders can be enabled for ADS-B through a software or hardware upgrade. If there is not an upgrade path, then the operator should do the research to determine what options exist for ADS-B enabled transponders for that aircraft. If the operator uses a call sign, for example life-flight operations, then the operator should ensure that the ADS-B enabled transponder they install has the necessary capability to support changing call signs. When making the decision to take the aircraft out of service are there other upgrades that would make financial sense? We’ve seen a number of aircraft owners undertake a complete cockpit or other refresh of the aircraft as part of the ADS-B work being done." Hennig offered a retrospective look at the FAA's ADS-B mandate and said that "we would have simplified the discussion around ADS-B a great deal if we had simply called the equipment and associated mandate what it is: a 21st century digital transponder that just happens to augment the transponder interrogation with a more accurate GPS position and some related data."